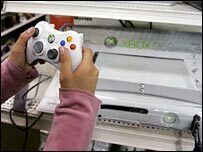 BT is teaming up with Microsoft to offer its television service via the software giant's Xbox 360 console. Unlike the dedicated set-top box the Xbox will not be able to receive or record live TV. To get the service, customers will have to first subscribe to BT broadband. As well as access to BT's library of on-demand content, users will also be able to watch hundreds of movies and other digital content, including its near-live FA premier League football matches. The tie-up was announced by Microsoft at the CES show in Las Vegas. BT is hoping that the partnership could help expand its broadband TV service by tapping into the popularity of the Xbox. Nick Thomas, a media analyst at research firm Jupiter, said: "It will definitely make its broadband service more attractive but there are challenges. People have to sign up to a 12 month broadband contract and not all Xbox owners may want to do that," he said. The fact that it cannot offer the Freeview content or DVR (digital video recorder) functionality of the dedicated BT Vision set-top box - known as a V-box - may also prove a barrier. "The reason for streaming only on the Xbox is because currently the console does not have the capability for live TV or enough hard drive for practical downloading of content," explained a BT spokesman. According to BT Vision chief executive Dan Marks the Xbox could be the first of several new platforms for the service. "Our aim is to provide BT Vision on multiple platforms - giving customers greater convenience, control and flexibility over what they watch, when they watch and how they watch TV, he said.